Victoria Mapplebeck is an award winning artist, director and educator. She is currently Reader in Digital Arts at Royal Holloway, University of London. 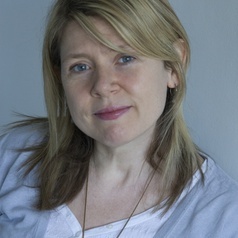 Victoria has spent the last twenty years working in cross platform production, developing new modes of audience engagement and interactivity. Her research explores the interface between emotion and technology, exploring how emotions change when mediated by communication and information technologies. She wrote and directed Channel 4’s first TV and online documentary series, Smart Hearts, in which web cams streamed live from the subjects homes for over 18 months. Described by The Observer as ‘A radical collaborative piece of art’, Smart Hearts explored the impact of interactive documentary for director, subject and audience and was nominated for a New Media Indie Award. Victoria has been commissioned to produce films and interactive artworks for BALTIC Centre for Contemporary Art, Dazed and Confused, Film Four, Film London, Channel 4, Creativeworks London and The Arts Council. Recently she has specialised in smartphone production and producing online video with impact. In 2015,she filmed and directed 160 Characters a smartphone short for Film London. Shot entirely on an iPhone 6, 160 Characters brings to life the secrets buried in a vintage Nokia, a story that unfolds in just 100 texts and tells the story of how two people, meet, date, break up and deal with an unplanned pregnancy. In 2016, Victoria wrote, directed and curated TEXT ME an award winning interactive multiplatform arts project produced in partnership with BALTIC Centre for Contemporary Art. TEXT ME is a live and online platform which creates an evolving and living archive in which users are encouraged to reflect on both the blessings and the curses of digital communication. During Victoria’s twelve month collaboration with BALTIC, she developed various platforms and tools in which our audience could collect, curate and share stories from their digital past. TEXT ME won The Merging Media Prize for Best European Cross platform Project and The 2014 Pixel Lab Prize. TEXT ME was also featured in Wired magazine and was selected for University UK’s 20 Ideas for Life, one of 20 national research projects, which celebrated ‘the impact universities have on everyday lives in the UK and beyond, including the value and importance of their world leading research’. Victoria writes media criticism for The Guardian, The Observer and Dox magazine. Her writing includes a chapter in The Tabloid Culture Reader, (McGraw Hill - 2008). Victoria is the Programme Director of the MA in Documentary Practice at Royal Holloway and teaches undergraduate and postgraduate students. She also supervises practice based PhDs.